Against a defensively excellent Hoffenheim side, Bayern struggled to victory which came late on through Lewandowski after yet another brilliant contribution by Douglas Costa in the build-up. The starting formations for the match. Guardiola’s team were organised in an interesting 3-1-2-3-1 formation which later became a 3-2-3-1 following controversial Boateng’s dismissal in the 73rd minute. Neuer was the usual goalkeeper behind a 3 chain consisting of David Alaba, the later-dismissed Jerome Boateng and Medhi Benatia, who was substituted late in the 1st half for Rafinha. Alonso again started at the 6 position before dropping into the defensive line permanently in the 3-2-3-1 and was flanked, albeit slightly higher up the pitch, by Arturo Vidal and Philipp Lahm. Costa played in his usual role down the left and looked to isolate Kaderabek frequently in 1v1 situations. The new Brazilian signing played a crucial part in the build-up to both goals, each time beating his man in the 1v1 to then make a low cross into the box. On the other wing was Robben who, although he did situationally create 1v1 situations, had a role slightly different to Costa which would see him rotate at times with Gotze and Muller. The two central forwards were very flexible in their positioning, at times not really having a ‘fixed’ striker. This can be said for Gotze in particular who made dropping movements throughout. Hoffenheim played with a very narrow 4-3-3 formation with three clear lines of players. The defensive system was an aggressive one as they looked to force mistakes through ball-near man-marking as they did to open the scoring in just 9 seconds. The home side made a very impressive defensive performance against Bayern and were lucky to finish the match with no points. Defending in an at times extremely compact 4-3-3 shape, 1899 looked to dominate the centre of the pitch whilst putting intense pressure on the Bavarian possession game through a strong ball-orientation. The shape itself was quite interesting with little graduations between the lines meaning that, should Hoffenheim have made a poor execution of this shape then valuable space would’ve been open between the defence, midfield and attack. However, due to their strong vertical compactness and ball-orientation in their pressing, little space was available as they rarely became unstable in their intense pressing. Markus Gisdol’s side marked man-for-man high up into the Bayern half when Pep’s team were building deep and they caused some great issues in doing so. From the 9th second and onwards, Hoffenheim looked to cause the similar issues during Bayern’s early possession which resulted in them taking the lead early on, often forcing them into inaccurate balls high up the pitch. Hoffenheim’s man-marking during deep Bayern possession. The heavily ball-oriented defensive block worked well in closing out the usable space around the ball and supported 1899’s ability to isolate possession. It allowed them to exert a good level of control in the important spaces near to the ball and centrally whilst leaving open the ball-far wing where Bayern struggled to develop access to. Through good preparation and compactness, Hoffenheim consistently had a good defensive access to press the ball meaning that Bayern struggled to switch and especially when they attempted this early on, the pressure would force an inaccurate pass allowing for an easier switch for 1899. 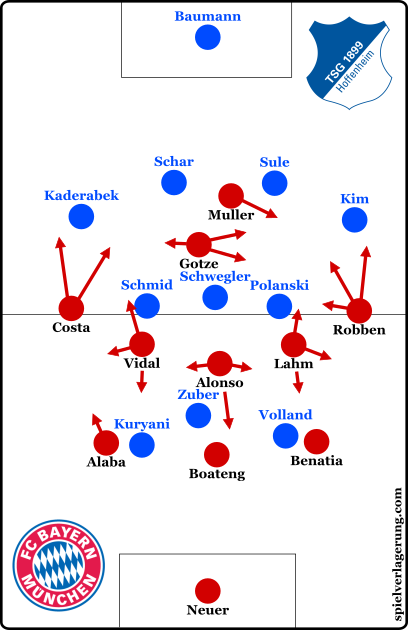 Hoffenheim controlled the centre, leaving Bayern to the spaces on the outside of the block. As with most strong defensive performances, Hoffenheim’s organisation was orientated around control of the central channel and the half-spaces flanking it. Through this, Bayern were left with passes around the block, in a U shape with little real penetration which, when attempted, was rarely accurate. 1899 were more than content to allow passes into wide areas, and through effective horizontal shifts could isolate the ball before the Bayern player had the chance to move the ball back inside through a diagonal. Guardiola opted for a flexible 3-1-2-3-1 with the ball (as opposed to a 3-1-4-2 without it) although through looking at the lineup one would’ve expected a 4-man defence with Lahm and Alaba as full-backs, perhaps similar to the 4-1-4-1 we saw against Hamburg. 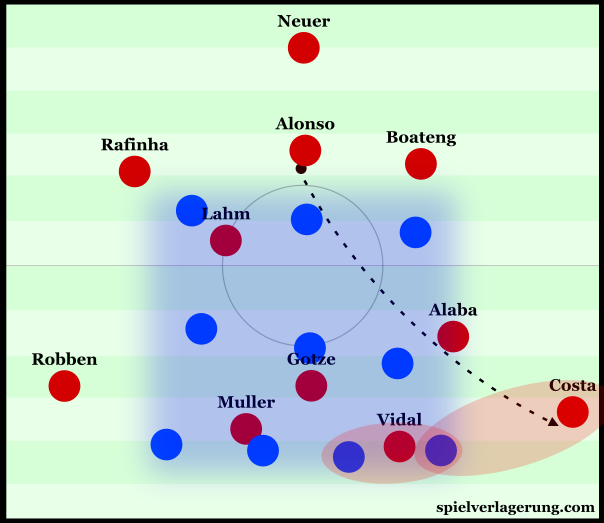 In early possession, Lahm and Vidal made dropping movements in order to support in the half-spaces through connections from the centre-backs to the centre and the near wide forward. This came to little success due to the pressing of Hoffenheim whose man-marking made any short build-up play difficult early on in the game. In reply to the man-marking scheme of 1899, Gotze and Muller situationally dropped into the holes and wouldn’t be followed too far by their respective defenders. Through this they created some opportunities for more direct passing into spaces however, often due to the deep ball position, they weren’t taken well. In a few moments, Mario Gotze could be seen dropping into spaces just above the first line of Bayern players as he looked to create the overload needed to progress the ball upfield against the pressure. Although he wasn’t followed by the deep Hoffenheim defender, these moments very rarely came to fruition due to some intelligent Hoffenheim spacing. The front 3/4 had very good horizontal distances between one-another meaning that they could accommodate and cover the extra Bayern player without much loss of stability or access in their pressing. It was little surprise to see Douglas Costa adopting his wide-left position again, sticking closely to the touchline. The Brazilian is proving to be a fantastic signing and he had a key role to play in the build-up for both goals. One of his biggest strengths is his 1v1 ability which comes largely down to his fast dribbling and pure explosiveness from a starting position which allows him to beat the majority of full-backs. Just before the equaliser, there was a shift in Bayern’s attacking strategy to be more exclusively focused on 1v1s involving Costa. This was likely in reaction to Bayern’s inability to penetrate the centre of the pitch, whilst they looked to take advantage of the horizontal compactness and ball-orientation of the Hoffenheim block. Diagonal switches became more and more frequent as Bayern looked to drag Hoffenheim towards the right and then switch to isolate Costa against Kaderabek. In transition, Hoffenheim lack access and are very narrow. Above we can see a common pattern of Bayern’s slowly-developing attacking strategy. Alonso had just collected the ball from an 1899 clearance as the home team are still moving out from their low block. Because of this they lack defensive access and Alonso is free without pressure, one could also make the comment that Hoffenheim are slightly too narrow given the situation which leads Costa with lots of space on the touchline. The Brazilian receives positional support from fellow-South American Arturo Vidal and Alaba, who occupy the nearby players in order to better emphasise the 1v1 closer towards the Hoffenheim goal. Great match, thanks for the breakdown. Both teams showed a formidable level of compactness in defense, especially horizintally. And Bayern’s posession game was defintely improved in comparison to the HSV-match, the performance with 10 men was particulary impressive. How would you describe Vidal’s role and rate his performances so far? I’d say he played less “spectacular” than some may have expected (not so many attacking runs into the box) but instead delivered support to circulation of the ball and kind of balanced the movements of some other players. And while I was not really convinced by his positionings at the beginning against Hamburg, he improved apparently in this aspect against Hoffenheim in my opinion.